Big Differences In Public Opinion of Climate Change In Canada And The U.S.
A fresh public survey and a new report [PDF] from the The Public Policy Forum and Sustainable Prosperity, confirms that a wide gap exists between Canadian and American perceptions of climate change. In the fall of 2008, nearly three-quarters of Americans accepted the reality of global warming and for a time, it seemed that American and Canadians views of climate change were quite similar. What a difference two years makes. Four in five Canadians believe that climate change is occurring and this figure has been relatively stable over time. South of the border, as recently as several months ago, and after incessant attacks on the science of climate change, support fell to barely half and has only just been rising to around 60%. Additionally, industry-funded confusion campaigns, political attacks on scientific integrity and ginned-up scandals like “Climategate” are much more effective in the U.S. than in Canada. Some 47% of Americans believe that scientists overstate the risks from global warming, compared with 36% of Canadians. 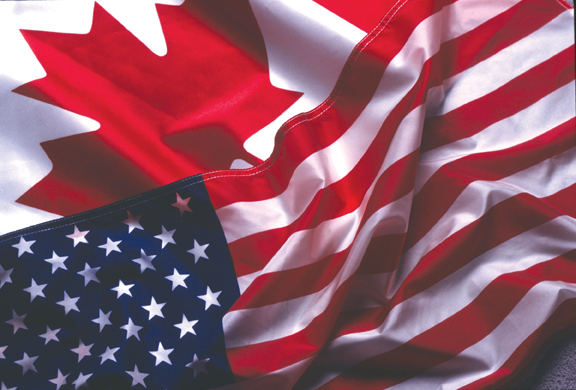 How Canadians and Americans shape their views of climate change helps to explain the divergence of their opinions and erosion of U.S. support. Americans tend to believe in global warming according to socio-economic indicators including age, race and education. What’s more, although not too shocking, political affiliation is also a key indicator. On the politics of climate change, 69% of Democrats agree that global warming is occurring, compared to just 41% of Republicans. Independents come in around 56% and oddly, 54% of the Kochtopus funded Tea Party believes in global warming. In Canada, regardless of gender, age or education, around 80% of people trust climate science. In fact, political affiliation is the only field where there is a noticeable difference in levels of Canadians’ support. Like their U.S. counterparts, conservatives are less likely to believe in global warming (64%) as opposed to between 84% and 91% for each of the four official opposition parties. The heavy politicization and false claims that there is a “debate” about climate science in the U.S. prevents the country from moving towards solving the challenges this issue poses now and in the future. This is not the case in Canada where the focus is more attuned to how the government and society should deal with the issue, and not on whether or not climate change is happening. There is also an interesting difference in American and Canadian opinions of who should pay for reducing carbon emissions. When it comes to taking action to stabilize the climate, more than half of Canadians are willing to pay a carbon tax in order to curb emissions. In the U.S. less than a third of Americans support such action. Additionally, many more Canadians are prepared to pay extra for renewable energy and cap and trade is also much more popular. Across the 11-page report, perhaps the most surprising feature is that in Canada, in spite of the fact that the Conservative Party has held power for just over five years, all the while opposing any action to cap carbon emissions, 70% of the population still feels that their provincial government should take immediate action. This study is only a preliminary comparison of the two countries. It reveals the uphill battle that Democrats will have in the U.S. in order to win back public support for climate action, but suggests that this is possible and that science and facts sway opinion. In Canada, the findings provide added evidence that the current government’s stance of inaction is contrary to the wishes of most Canadians, suggesting that the recommendations it receives calling for carbon pollution reductions could become a leadership issue for Canadians in future.